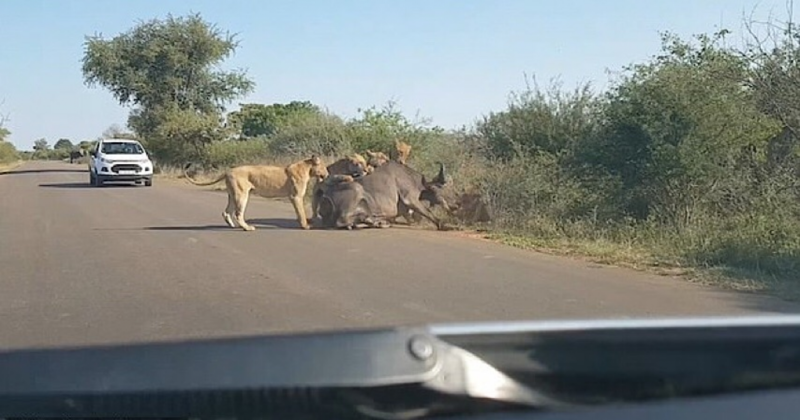 Pride Of Lions Savagely Take Down Massive Buffalo On The Road. Lions are nature\’s most formidable hunters on land. Over the course of a hunt,­ they work together, communicate and change strategies, positions and roles when neede­d. Armed with large, sharp teeth and claws and able to cover 100 yards (91.4 meters) in about six seconds. 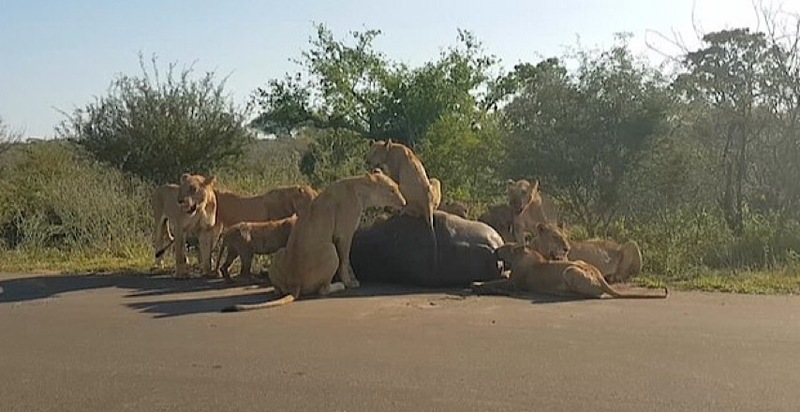 A pride of lions take down a huge buffalo in the middle of the road and begin feasting on it. The footage was captured in Kruger National Park, Mopani, South Africa by some tourists who were in the tourist jeep as they begin to drag the enormous beast to the ground. It was really a shocking moment - the big cats clamber on top of the buffalo and use their powerful strength to trap it beneath their weight. The lions were able to take down the big buffalo at last. The buffalo also tried his best to be free from the encounter but failed at last. Moaning can be heard as it struggles to fend off the lions as it is taken down. But soon the large creature is overpowered and the lions have won their prey. Another lions, including cubs joined together to feast on the prey and they surround the buffalo with one even sitting on top of it. It became a great feast for them in the day. They pride of lions gorge on their winning catch which lies defeated on the road. The lionesses are often the hunters in a pride, and usually make sure to attack big animals - such as these buffalo - in a group for safety. Obviously, the buffalo are wise to this and usually travel in massive herds to help protect themselves and the group.